Poetry. Paper, perfect bound, 81 pp. 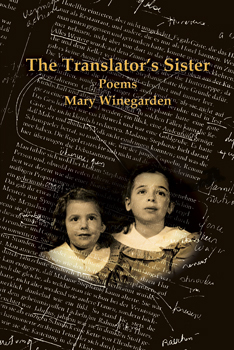 In response to the unexpected death of her sister Katharine Washburn, Mary Winegarden has taken on the challenge of translating their lives into living language. Using phrases from Washburn’s work as her foil, Winegarden creates a moving meditation on the bonds of sisterhood. Crossing boundaries between prose and poetry, fiction and memoir, convention and experimentation, The Translator’s Sister resonates with the intimacy and humor of remembered details, with loss translated into art. This shimmering conversation will sweep you in. It is rare to find a poem so captivating you can’t put it down. On the borders between memory and imagination, Mary Winegarden’s conversation with her dead sister shape-shifts and shimmers. Through the fractures in her dreams, she conjures brilliant glimpses of a shared childhood: the colors and smells of times past; gleeful secrets; a forest of loss. – Lucy Goodison, author of Moving Heaven and Earth: Spirituality, Sexuality and Social Change. Mary Winegarden grew up outside Washington, D.C. After graduating from the University of Chicago, she worked for several years in community arts in London, and then moved to San Francisco, where she earned her M.A. in Comparative Literature. Mary Winegarden’s translations of Russian poets have been published in Magazine and in Crossing Centuries: An Anthology of Contemporary Russian Poetry (Talisman House). Her poems have appeared in the journal 26. She teaches English at San Francisco State University, and is working on a new collection of poetry, Chiasmus. She lives in San Francisco with her husband, actor Geoff Hoyle. Her sister, Katharine Washburn, was a critic, editor and translator of poetry from classical and modern European languages. She co-edited World Poetry: An Anthology of Verse from Antiquity to Our Time as well as Dumbing Down: Essays on the Strip-Mining of American Culture and Tongues of Angels, Tongues of Men: A Book of Sermons. She was also the acclaimed co-translator of Paul Celan: Last Poems. Ms. Washburn was on the editorial staff of the Book-of-the-Month Club. She had been working on her first novel, The Translator’s Apology, when she died in March, 2000.